I started this life travelling on the path my parents’ and child’s wisdom set before me. As I grew into a woman, my childish wisdom disappeared. My adult wisdom became naïve, and I lost myself. Then, one day, on this path of naïve wisdom I ran head-on into a hurricane, and my life’s direction changed. Today I am steadfast on a journey leading towards wisdom, an open heart, balance and peace in my body, mind and spirit. I carry the roadmap to this journey in my heart, and I bring it to every class that I teach and I offer it openly in hopes that it serves as a guide to help the woman I serve on their own journey of self-discovery and healing. The first time I practiced yoga it was in a classroom on the top floor suite of a downtown building. The room was scorching hot in the summer and clad with industrial carpeting. It was sweaty and smelly and not what my 17 year old self might considered “cool”. This was the late eighties - before yoga hit the mainstream - and yoga did not fit with my self-concept – but somehow it felt comfortable. Part of me yearned for something more meaningful, some form of spiritual enlightenment or guidance. These early classes influenced me in many ways but I did not develop a regular practice for several years. The seeds of the first class were planted and finally blossomed into a regular practise about 15 years ago and lead me towards teaching eventually Yoga Therapy. My journey towards becoming a mother was by far the most heart-wrenching and foundational journeys of my life. From the complex grief and heartache of infertility, to the joys of pregnancy, to the overwhelming anxiety and bliss of mothering a human, through to the shock of a second pregnancy that ended with the grief of miscarriage. 10 years later I feel like I am finally settling into the full spectrum of Womanhood and what it takes to be a Mama to my spicy and beautiful daughter. Along the way it seems like almost nothing went as planned and yet I have made it almost a decade and in the my bones I know I am better for all it - even though it doesn't feel it everyday and it certainly didn't feel it along the way. Yoga Therapy has been the essence of my healing and it is my honour, privilege and dharma to help support other women on their journey of raising themselves and rising up from the ashes of a culture that does not support the full breadth of what it us to be a woman. Over the years I have studied mindfulness techniques and many different styles of yoga including Iyengar, Hot Yoga, Flow, Vinyasa, Hatha, Ashtanga, Jon Kabat-Zinn Mindfulness, Kundalini and Yoga Nidra to name a few. I have also trained in Ayurdevic practices which is an integral part of my Yoga Therapy client assessments. I was very fortunate to receive my RYT200 certification with three of the best teachers I have had the honour to practise with, Patricia White (Hatha), Kathryn Beet (Vinyasa) and Hali Shwartz (Yoga Philosophy) at YogaSpace in Toronto, Ontario. 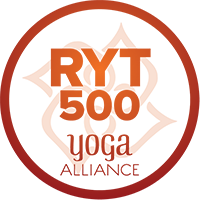 In 2015 I completed RYT500 specializing in Yoga Therapy with internationally recognized school Inner Peace Yoga Therapy. In this program I learned from some of the most brilliant and inspiring Yoga Therapists in North America including Nischala Joy Devi, Amy Weintraub (Life Force Yoga®), Neil Pearson (Life is Now Pain Care) and Antonio Sausys (Yoga for Grief). I received my CIAYT certification as a Yoga Therapist in July 2018. In August fo 2018 I received my Postpartum Doula certificate and am working towards my Certification through DONA International. You can read a list of all of my training HERE.